PowerGame™ is the perfect outdoor playing surface for almost every sport including basketball, soccer and tennis. It's a revolutionary new surface that provides superior traction capability while minimizing skin abrasions in the event of a fall. Thereby, the patented Double-Tier shock absorbing grid and Lateral Forgiveness™ reduce joint strain and fatigue to help your family, friends or team play longer and more safely than ever. Athletes and orthopedists alike know concrete is the archenemy of the knee. Unlike pavement, our Ortho-Cush™ surface softens the blow as you come down for a rebound and springs back for the fast break. It's the highest rated athletic surface available on the market. 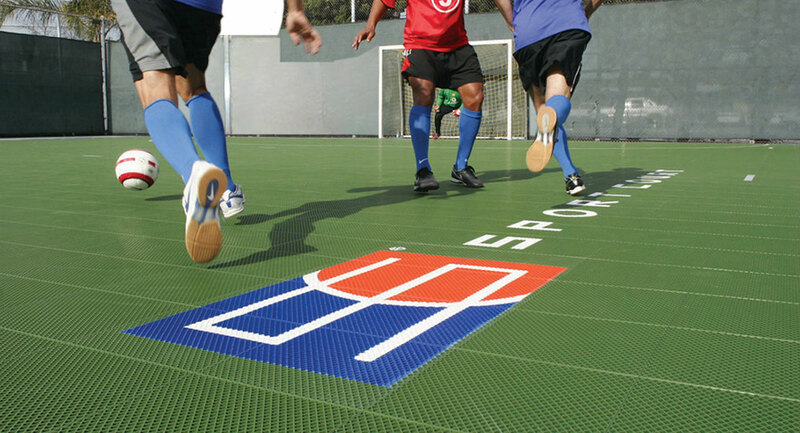 -Moisture resistance, specialty grid design lets water drain creating long lasting and fast drying sport surface. Ready to let your team, family or friends play outside on our Court, Contact us as soon as possible!